What can be better than a sweet treat with health benefits? As it happens, our favourite February food, chocolate, has a few glowing characteristics. It comes from the Theobroma cacao tree, from a bean that grows on that tropical tree. (Theobroma means “food for the Gods.”) Chocolate originated in Mexico and Central and South America, but West Africa now produces most of the world’s cocoa. Look for fair trade chocolate that meets environmental and labour standards at natural foods markets in Kitsilano and the West End, at Karmavore in New Westminster and at Nature’s Fare Markets throughout the province. Dark or semisweet chocolate is typically a vegan product. Because chocolate contains antioxidants that inhibit the oxidation of LDL (bad) cholesterol, it has gained a reputation of being beneficial for our heart health. Eaten in moderation, chocolate may lower blood pressure. Chocolate is also a source of iron – a “precious metal” when it comes to human health. As part of red blood cells, iron plays a central role in transporting oxygen to the body and carrying away the metabolic waste product carbon dioxide. Each day, we lose tiny amounts of iron in cells that are sloughed from skin and the inner lining of the intestine. If our intake is insufficient to replenish our losses, a tired feeling and sensitivity to cold may develop. With further depletion, people feel exhausted, irritable, lethargic and develop headaches; the skin may appear pale. Since iron deficiency is such a prevalent condition and easily diagnosed, if you have any doubts about your iron status, have a lab test done. We are efficient at recycling iron, however, losses must be replaced. Iron-rich foods include beans, nuts, seeds, whole grains, dried fruit and chocolate. 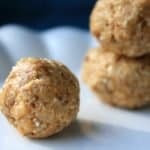 Two of the Almond Butter Balls in the recipe below will provide one quarter of the recommended intake of eight mg iron for the day. Women of childbearing age need more iron so they can double the recommendation. Put the rolled oats in the bowl of a food processor and process for 20 seconds or until they are finely ground. Transfer the oats to a medium bowl along with the nut butter, pumpkin seeds, currants, cranberries, chocolate chips, lemon rind, lemon juice, cinnamon, cardamom and vanilla extract. Mix with a fork until all ingredients are well incorporated. Add enough water to hold the mixture together. Roll into small balls, about two tablespoons in size and store in a covered container in the refrigerator or freezer. Vesanto Melina is a Langley dietitian and author (www.nutrispeak.com). Saturday January 28: Meet Vesanto at an author event at Wendel’s Bookstore and Café in Fort Langley, 3-7PM, www.wendelsonline.com. While you’re there, treat yourself to a warming bowl of soup.